Thomas Brodie argues that the Gospel accounts of Jesus, both his deeds and teachings, are like other literature of the era insofar as they are creative re-writings of earlier literary sources. The best known example of such creative imitation in the classical world is Virgil’s use of Homer’s epics to create the Aeneid. What is less well known is how pervasive this sort of literary imitation (and creative emulation) was in the Hellenistic and Roman worlds. Many scholars have pinpointed isolated passage in the Gospels that appear to be derived from other literature (e.g. Jesus raising the daughter of Jairus is very like similar miracles by Elijah and Elisha) but Brodie goes well beyond these arguments and into a quite different dimension of literary analysis, as I will explain below. He also argues that the hypothesis that the Gospels are derived from oral traditions is flawed for many reasons. In Chapter 7 of Beyond the Quest Brodie gives a 26 page detailed explanation of what is involved in identifying the source of Luke 9:57-62 in 1 Kings 19. Six of those 26 pages set out in small font the relevant Greek texts and translations side by side. This is the sort of detail that Brodie explains he did not have space to include in his 2004 tome (680+ pages) identifying the sources of New Testament writings, The Birthing of the New Testament. But of those 680+ pages Brodie only gave a 6 page explanation of how those six verses are derived from 1 Kings 19. In Beyond the Quest we are treated to the full course banquet. Is Brodie suggesting that a simplistic spotting of supposedly parallel words (even prepositions) is becoming commonplace in the academy? If so, what can he possibly mean by a “transforming process”? What is it about supposed ancient literary mimesis that might “seem strange”? Aren’t we talking about a subjective Rorschach test, identifying shapes in clouds, bizarre parallelomania? That’s what Dr McGrath wants readers to think. He even tells them to read Brodie’s book after telling them that these are the glasses through which they must see it if they are to maintain his respect. But how does ancient mimesis really work and how can modern scholars detect possible instances and then, most importantly, how can they test and verify them? Firstly, Brodie analyzes the passage in Luke as a literary composition. The structure of the passage is identified. As often happens in crafts, or sports, or sciences, or relationships, patience is necessary to get inside what is happening. To begin with, the context is established. Luke 9:51 to Luke 10:20 is subjected to a detailed literary analysis. The structure of this passage, it’s divisions of thought and motif, begin to bring a reader into the mind of the author. What was the author doing as he wrote this passage? He wasn’t just telling a story; he was structuring the events, the dialogues of questions and answers, in a crafted presentation. Comparisons with a shorter version in Matthew 8:18-22 are recognized. The input of the Q hypothesis is considered and added to the mix of analysis. Wider scholarly publications on this passage are consulted: in this case special attention is given to Fleddermann’s Q: A Reconstruction and Commentary. Fleddermann appears to identify something (this is me talking here, not Brodie) that would be called a “flag” — a signal to readers to identify the source-text. That is, Fleddermann (as Brodie acknowledges) has concluded that in the Lukan passage Jesus’s reference to taking the plough and not looking back has significant similarities with Elijah’s call of a young ploughman (Elisha). 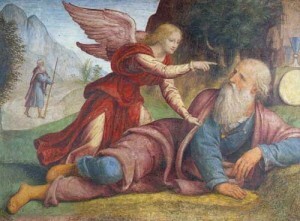 There are other connections, too, such as Lot’s wife being instructed not to look back. A possible source text, 1 Kings, is similarly analyzed. What is it’s structure? Of what themes does it consist? And how are these pieced together? Do scholars acknowledge that 1 Kings 19 is truly a literary unity? If not, why not? How does the final product read? In this case the identity of 1 Kings as a possible source text since in both larger passages there is reference to fire coming down from heaven and to setting out on a new journey. What that possible connection is, however, is by no means obvious. How do the two texts compare? That is, not how might they be framed as similar, but setting out the key thoughts of each, what happens when those thoughts in those structures are set side by side? Is there a literal match? a conceptual match? a kind-of funny cloudy match? a non-match? Let it all fall where it will. Anyone impatient to find fault with a “mythicist” would not bother with any of this detail. I imagine he would skip it all and look for something damning. Contrary evidence would be of no use. Evidence that refutes the “parallelomaniac” perception will not compute in the mind of such a reader. It will be impatiently dismissed. When Brodie does examine points in common it is not single words but syntactic structures and the patterns of their location in the run of larger thought-forms, their relative frequency in the totality of Biblical literature (p. 66). or from Luke’s own vocabulary. Ask, then, what room is there for any genuine words or action of an historical Jesus here? Luke is not just playing with linguistic trivia. He is keeping elements of the passing on of the mantle of prophecy. Elisha burned the plough to stay with the mantle, but in Luke’s account of the call, the new mission still keeps the plough — as a metaphor, an indication of future fruitfulness and clear focus. . . . The metaphorical extraction from literal scenes in a source document reminds me (these are my own remarks here, not Brodie’s, though he would probably concur with them) of several passages across Virgil’s imitation of Homer and developments of his own imagery. Physical prowess in the source text is surpassed by matching spiritual superiority in the imitating text; a thunderstorm with deadly lightning at the beginning of an epic is matched by a spear thrust that strikes “like lightning” at the end. The opening of Elijah’s journey proper, the beginning of his journey in the wilderness (1 Kgs 19.4), provides immediate encouragement. Its eight opening words contain variations on all six of the opening words of Luke about the journey of Jesus (Lk. 9.57). Further investigation shows wide-ranging similarities and adaptations. The form used by Luke, that of three pithy repetitive exchanges, follows a form that he himself had used earlier in reporting John’s replies to would-be doers (Lk. 3.10-14); and these exchanges also incorporate some of the repetitiveness of 1 Kings 19. Both 1 Kings 19 and Lk. 9.57-62 are essentially three-part, but in both cases the central part is more sharply challenging and . . . more elaborate. The heart of both texts is a variation on the call of the Old Testament prophets. 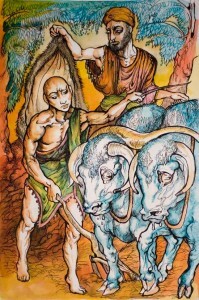 In addition, Luke turns elements of plot, actions described as really happening, into metaphors: not being allowed to stay lying because of food at one’s head becomes not having a place to lay one’s head; emphasis on the dead becomes partly a metaphor for the spiritually dead; God appointing kings becomes a basis for referring to the kingdom of God; and ploughing turns into the metaphor of the plough. In addition, Luke interweaves the use of 1 Kings 19 with the use of other texts, and he adapts the final shape of the text to his own context. . . . . Continued analysis shows similar procedures in the full detail of Luke’s work. Even the repetitive use of indefinite pronouns to indicate Jesus’ interlocutors, ‘someone’, ‘another’, ‘another’ (9.57, 59, 61), consists of repeating and varying the indefiniteness of the ‘someone’ who first speaks to Elijah in the wilderness (1 Kgs 19.5). Likewise regarding the content within the framework. Essentially every word, every image of the entire text of the triple challenge is built either on the LXX (on 1 Kgs 19 plus associated references) or on Luke’s distinctive vocabulary and purpose. Occasionally Luke’s distinctive vocabulary has curious affinities with the Epistles . . . . .
At times Luke may seem to reflect material from another source, for instance in referring to the foxes and birds, but these animals fit perfectly with the image of the wilderness, and with other Septuagintal references to foxes and birds . . . . Even unusual words, such as ‘permit’, ‘say goodbye/take leave of’, and ‘worthy’ . . . . reflect Luke’s distinctive vocabulary (Fleddermann 2005: 396). The result of these procedures is that the sub-text, 1 Kings 19, is not just edited or redacted. It is transformed. Redaction is indeed present in the composition of the Gospels . . . but as the critique of John Van Seters (2006) has partly indicated, the role of redaction in composing the Bible has been exaggerated. The role of redaction has been particularly exaggerated in discussions of Q. Since Matthew and Luke used redaction in dealing with Mark there is often a presumption that they also used redaction in dealing with their other sources. . . . .
Also unjustified, by implication, is the hypothesis that Luke’s narrative owes anything to oral tradition derived from historical events. I refer to Brodie’s explanation for Matthew’s shorter version in the comments below. What is important is that, as Lk. 9.57-62 illustrates, the literary roots of the Gospel text can be traced, often in considerable detail. While it is useful and necessary to employ all the resources of historical investigation, of ‘historical cricitism’, including archaeological excavation of sites, it is also necessary to try to trace the pen of the evangelist. Luke’s reworking of 1 Kings 19 shows an extraordinary attention to the entirety of the older scriptures, everything from the scope and depth of their vision to the detail of their fabric. He distils the essence of 1 Kings 19, its increasingly sharp word to the dead heart, but he also harvests many of its actions as metaphors, and he gleans many details that preserve something of the texture of the old and that lend character to the new. But the character of the new is another topic. That “other topic” is the theme of Act 3 of Making of a Mythicist series — yet to be posted. McGrath has no patience for any of the above and scoffingly says that the application of Brodie’s method applied to his own book could prove it he was really writing fiction based on the stories of others! McGrath could quite easily verify that claim. He knows the method. He only has to apply it and demonstrate his assertion. But I don’t think he’s that dedicated to demolishing “mythicism” through anything other than sarcastic dismissals. Real work time is reserved for Dr Who reviews. Posted on 2013-07-16 09:50:56 GMT+0000 by Neil Godfrey. 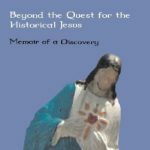 This entry was posted in Biblical Studies, Book Reviews & Notes and tagged Brodie: Beyond the Quest for the Historical Jesus, Thomas Brodie. Bookmark the permalink. If Q is unnecessary here, how does Matthew’s version of these Lk/Q 9:57-62 verses fit into the picture? If Luke is working in glorious isolation to create a transformation of 1 Kings, what was Matthew doing? Moreover, since the Gospel of Thomas shows knowledge and circulation of one of the elements making up Luke’s transformation of 1 Kings, where did GTh derive the saying (#86: “The foxes have their holes, etc.”)? Doesn’t the process of discrete sayings separately witnessed to elsewhere morphing into larger units such as Lk/Q 9:57-62 and its parallel in Matthew speak to a process of redaction going on prior to the presence of the “Q material” incorporated into the Synoptics? Doesn’t the clear similar amalgamation of prior elements into a unit like the Dialogue of Jesus and John (Lk/Q 7:18-35, which also contains a GTh precedent) speak to a redactive process preceding the writing of Luke and Matthew, and their usage of the results of that process–namely, a Q? Brodie does not use Luke 9.57-62 to argue that Q is unnecessary. He argues, as I quoted, that “in this case Q is unnecessary”. I don’t believe it is quite fair to accuse Brodie of overlooking the Q option because he is supposedly somehow “fixated on Luke and the OT”. As I pointed out, he does certainly take in a range of possible sources, and Q is one that he does take seriously in his considerations. Brodie is by no means ignoring the Q argument. Recall Fleddermann. I also included brief snippets of references to other sources, in particular the Epistles. He also discusses the foxes and birds allusions, and the thematic relevance of tying in certain images from elsewhere, including Ruth and Ezekiel. But I cannot repeat all the detail in this post or comment. As for Gospel of Thomas, I understand that a major platform for asserting its independence derives from dating it very early. I would like to see the early date defended against the arguments of Nicholas Perrin in his Thomas and Tatian: : the relationship between the Gospel of Thomas and the Diatessaron. is relatively easy to explain: Matthew used this part of Luke’s text but adapted and abbreviated it, as he frequently did with Mark’s text. Of course, this raises the question of Matthew’s overall relationship to Luke, but that was already mentioned when outlining the sequence of the New Testament documents . . . (see Making of a Mythicist Act 2, Sc 2), and has been discussed at length elsewhere — essentially to say that Matthew first used a brief Elijah-based version of canonical Luke (a work containing Lk. 9.57-62), and that, as a later stage, canonical Luke-Acts used Matthew. The credibility of the brief Elijah-based version of Luke — based on the whole Elijah-Elisha narrative — rests especially on the fact that, like Lk. 9.57-62, it is rooted solidly in an extant text, the LXX, and so, as the analysis in this chapter indicates, it is verifiable in a way that Q is not. (p. 76 of Beyond the Quest. I remain open-minded on the Q question. I often write something with Q as a given. But my initial questions about the rationale for seeing Luke as independent from Matthew have never been answered completely. For example, Luke’s Beatitudes demonstrate, to my mind, a redaction of Matthew’s that is in consistent harmony with the remainder of Luke’s thematic interests. Matthew speaks of the poor in spirit and Luke is stressing from the beginning the theme of the literally poor and destitute being raised up to overturn the natural order of things. I have posted details elsewhere, maybe could do so again since that was a long time ago. Ditto for Luke’s Plain versus the Matthew’s Mountain. That strikes me as a conscious rebuttal on Luke’s part. I know there are other details in the Q argument and that what I have covered here does not address all of those. Brodie is not using Lk. 9:57-62 to deny Q. He is only using it to deny its necessity to explain the evidence in those verses. Of course there is much else to the Q argument that must be addressed. Maybe the whole discussion needs to be revisited. If possible, maybe you can give Goodacre’s The Case Against Q the same treatment you’re currently giving Brodie’s? Yeh, unfortunately I read Goodacre’s book well before I started blogging and read so much afterwards that I lost any clear view of where I stood in relation to it originally. Maybe it would be good to post on his basic points along with a range of (snippets from) academic reviews of it. Re “Q” have a look at more recent critiques by D. J. Neville & D. B. Peabody. You have asked us to read these books many times now and indeed I have them on my ‘to read’ list. But I can’t read anything at once. Besides, it would be more interesting if when relevant you could present their arguments here. Impossible to summarize 800 pages here, but thank you. Please delete my redundant suggestion. Brodie says that the relationship between Matthew and Luke in regard to the passage in question is “relatively easy to explain” by saying that Matthew simply redacted an Ur-Luke? Considering how much effort has gone into “explaining” how Luke used Matthew in the traditional manner to set aside Q, I wonder if he isn’t being a bit simplistic here. Has anyone actually put together a case for the Synoptic trajectory running from a priority of Ur-Luke (before even Mark?) to Matthew to canonical Luke? (It’s enough to create a whole new species of migraine.) But, of course, that’s what makes NT studies so fascinating. But I’m not running Brodie down. He is probably the most exciting thing to come along in a long time, and thanks to Neil for laying him out for us. I do have a 60 page monograph or journal — the pages are very large magazine or small newspaper size pages — fairly small font, by Brodie, arguing his case for Proto-Luke. Published by the Dominican Biblical Institute, 2006. Unfortunately I have to confess I have not read it yet. Partly the fault is the physical size of the publication — it is not so easy to take along and pick up to read at convenience. Needs a full table and time set aside for nothing but. Yes, I agree about the Ur-Luke trajectory. What I would like to do as a project when I’m free from other commitments (ha!) is to lay out the various arguments for that Ur-Luke and compare them. I’m thinking in particular of the pre-Marcionite “Luke” and what that looked like — and to compare with Brodie’s idea of it. If they are hopelessly at odds then I’ll roll my eyes in despair and wait for something new. If there is a tolerable measure of overlap I’d be very interested. That is one thesis. But a pre-canonical version of the gospel is not an idea that is necessarily tied to a Marcionite scenario. Joseph Tyson and others do argue that Marcion used such a version of Luke. Brodie’s argument for an earlier pre-canonical form of the gospel has a different derivation, however. I understand at the moment that he bases his idea upon an apparent “intertextuality” between sections of Luke-Acts and the Elijah-Elisha narrative. It would be interesting to compare the details of the two types of theses. I read this passage over the weekend while traveling between the US and Asia, and it resonated with me personally. For the last 20 months, I have been pursuing my own thesis regarding the origins of the Old Testament, and I have found two very different applications of the type of patience Brodie counsels. First, I have specifically sought out as many sources from multiple disciplines, and what I search for are clear indications of the cognitive biases of scholars. The earliest discussion of the Elephantine Papyri (c. 1905), for example, ignore major inconsistencies with the very concept of monotheistic Judaism to confirm that the Papyri prove the accuracy of Nehemiah. Looking for the flaws of the establishment’s picture yields fertile ground for further inquiry. Second, I have specifically sought out evidence that contradicts or negates my thesis. The result is that my thesis has evolved over time, and I have identified areas of softness/weakness (due to lack of sources) that need to be admitted and explained. Being patient cannot only mean being receptive to the strange but also being open to rejecting or altering it as more context is understood. I think some of us amateurs fall in love with our theories and can take things too far. For example, I know you don’t care much for Joseph Atwill, but if he limited his theory to the idea that Josephus’s The War of the Jews was the Q document (which, although he appears to be oblivious to the fact, implicitly is his argument and follows logically if Josephus were first, which, according to Robert Price, some scholars apparently believe) and then admitted to speculating that the Flavians sponsored a school of scribes to write the Synoptic gospels, then he would be consistent with Brodie’s own speculation of a “school” of New Testament authors, which he details in Chapter 19 of Beyond. I used to do a lot more study of particular themes (Gospel of Peter and relation to gospels; ending of Mark; what Justin knew, etc) when I had a less demanding job. Now I’m waiting till my retirement before I can return to giving specific topics the thorough studies I used to give them. But all’s good. I have a chance now to share lots of stuff I have read and am continuing to read, and writing stuff up helps me digest it, too. I do like the idea of a school of NT authors — it’s the very concept that has been advanced by one or two of the “minimalists” with respect to the writings of the Prophets in the OT. They are in dialogue with one another. That sounds very much like the Gospels and even some of the epistles. I have to confess I have a hard time understanding this being sponsored by any imperial authority, though. I can’t get around the idea of starting a religion that you will soon enough seek to persecute or frown upon. Besides, I can’t escape the attraction of so many tantalizing hints that the gospels hail from the second century, even post the Bar Kochba war. My problem with Atwill’s theory is his breathless, certain presentation of it as fact when it is highly speculative and should have been admitted as such, if only to add credibility and suggest avenues that can be explored to confirm or deny the theory. Personally, I cannot exclude the possibility of imperial (even Flavian) sponsorship of the NT because (1) something cannot become canon without a central authority saying so, and (2) I just don’t know enough about Roman history to test the theory at this time (but I hope to have time in the next year or so). On the other hand, I am very skeptical of claims of early Christian persecution (made primarily by Eusebius), and even to the extent that I can accept such claims at face value, the idea that a later imperial dynasty would persecute the cult of a former imperial dynasty does not seem unlikely. But my point was not to advocate for Atwill, it was only to use him as an example of what Brodie’s sense of patience is not. You really have to temper your love of your own contrarian ideas to present them successfully (i.e., without deserving ridicule) to others. Anything far out of the mainstream will be rejected out of hand. In some ways, though, I think Brodie is too apologetic in that he seems to try to reconcile being both a mythicist and a believer (I have only skimmed the final chapters, but that seems to be what he is saying). On the other hand, what seems to make him a believer is his believe in the propensity of mankind to understand and distill beauty, even if it is shadowed at times, which seems to reconcile Christianity and secular humanism. I don’t know . . .
By the way, I have purchased a couple of other Brodie books now, as well as some of the mimesis books to which Brodie cites. I have also purchased Argonauts of the Desert, which one of the articles you cited to awhile ago led me to. I very much enjoy what you do here. Thank you. Some subjective comments: The teaching material used by Matthew is according to Brodie much less than what is usually considered to be in the Q document (though it could be the logia described by the unreliable Papias). I like the idea because it is not just a rewriting of Deuteronomy but an inspirational rewriting with a sublimity of a kind I do not see elsewhere in Matthew ( though sublime writing is not always a good guide to action). That the rest of Q comes from Gospel writers commenting on, criticising and inspiring each other, rather as Thompson suggests the old testament implied prophets did, is a nice idea, for the ideas of witness, self worth and patronage were difficult to deal with all at once in the early empire. Another HJ (Zealot version) for the pile. But the interesting point is who wrote it: Reza Aslan. http://www.cfr.org/religion-and-politics/can-we-know-jesus/p31105. That’s the Council on Foreign Relations’ website. Google Aslan for the context. Here’s Aslan on the Daily Show. The Daily Show is not available in some countries outside the U.S.
-Darn. I could type a transcript. There is a discussion about Aslan’s piece on FRDB: http://www.freeratio.org/showthread.php?t=326553 — you might need to register to enter and read it. I was typing my transcript as your comment appeared in my notifications. The message is “Sorry, registration has been disabled by the administrator.”. Is this book really the “big thing” in the U.S. now? I’ve been involved in a little discussion on rationalskepticism.org recently trying to point out in another context that this standard view of the historical Jesus is without any supporting evidence. It’s a Robin Hood or Peter Pan fairy tale Jesus. For starters, all that turmoil Aslan speaks of came AFTER the supposed time of Jesus. Jesus was betrayed because according to one version he was happy to take from the poor and bestow upon himself in a ritual anointing; then these masses he supposedly was dying to defend are themselves said to have been calling out for his blood; in other versions crowds left him because he offended their religious sensibilities (“eat his flesh, indeed”) or because they couldn’t make any sense of his mysteries. The only reason they came to him was because he either performed miracles and that’s what they wanted to see, or gave them a free meal. Meanwhile, he told them all to go the extra mile when coerced by the Roman military. He told the less poor to share with the most poor. Centurion’s worshiped him for maintaining their supply of Jewish servants (well, that’s one way of looking at one of his healings!). And as for the crime being placed above the cross, that’s outright denial of the evidence. The Gospels themselves point out that the crime was not written above Jesus’ head, and Pilate simply says, “Tough, what I have written I have written.” He did not write the crime, which was to “claim to be king of the Jews”. Finally, we have all those other bandits who never started religious movements. Presumably they were not interested in fighting for the poor, not even for their own class? That’s why they had no following after their deaths? And as for Josephus supposedly being so coy about calling these bandits “messiahs” because he didn’t want to offend Roman sensibilities — that’s nonsense: the same theologians will tell you he DID call Jesus, at least the brother of James, the “Messiah”, and he DID say that many Jews during the 60s were hoping for the messiah from their own ranks. There’s a simpler explanation for the evidence found in Josephus that does not resort to trying to second guess his and his audience’s thought-processes. Is Aslan’s book really gaining popular attention? Let me know and I might consider doing a fairer job of reading it first and then posting a review here. According to Amazon.com, it’s #2 in All Books, just below Rowling’s most recent book. So, yeah, it’s more popular than I thought and really is the “big thing” in the U.S. now. Anyway, what should I do with my half-finished transcript of the full interview? Should I continue transcribing the last two videos and publish the complete transcript as soon as possible or wait a while to add my commentary? Decisions, decisions. I opt for the transcript first. Probable answer: “a Ph.D in Sociology of Religions from the University of California, Santa Barbara”! A: knew that what he was writing didn’t actually happen. They weren’t interested in facts, they were interested in truth. The truth that is revealed from this story is that Jesus is born in the city of David and therefore he’s the, the inheritor of David’s kingdom and he is the anointed Messiah. But, the fact is that Jesus was probably born in Nazareth, I mean, if there’s one thing that everybody seem to have agreed upon, his enemies and his followers, is that he was a Nazarean. Yeh, We don’t believe a word of what is written by we sure as houses know for a fact it’s all true! Funny thing. The main objection to this book in the one-star Amazon reviews is “Oh, he’s one of them Muslamic people”. What’s untrue about Jesus walking an hour each day to Sepphoris? Also, how do you know it was not a crime to call oneself the Messiah in the Roman Empire? There were many “anointed ones” — mostly priests. Royal messiahs belonged to the world of theological literature. The evangelists recognized this and that’s why they were able to say Pilate found no fault in Jesus. Letter writers before them had no problems writing about their devotion to a messiah. The Messiah claim was not a crime. What was a crime was rebellion against Roman rule. Not the same. The poverty of a person in Nazareth was proverbial. How many years would it have taken Joseph and Jesus and his other brothers to have gained a few shekels enough to find a lodging closer to the benefits of a big city if they really were working there daily? How did they learn and practice their trade in a place as small as Nazareth to make them competitive in the Sepphoris market? How many hours did they work each day? How often? What pay? But ask especially what competition they had in finding work? I find it much easier to believe that if viable work were found in Sepphoris they would soon enough be living there with all the other benefits that come from the larger metropolis. But then we have to ask how Jesus ever found the time to become so learned in the scriptures. . . . . And why did his parables not reflect the sights and experiences of Sepphoris where he spent most of his days (even if he only slept in Nazareth) — given all the reconstructions that explain the imagery of the parables in terms of Jesus’ rustic ambience. . . .
Aslan’s book is available on Google Books for preview. 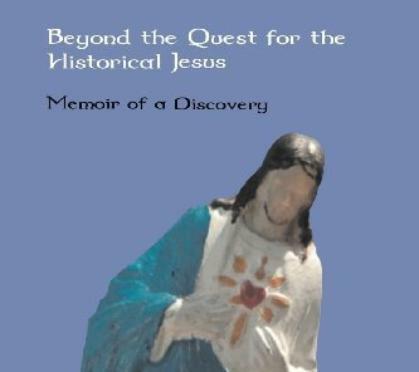 What if during most of the “missing years” Jesus was not working as a builder or whatever but studying religious documents in a religious community possibly in preparation for a mission?